H.265, also known as HEVC, is the next-gen video compression standard for high-definition videos. Given the same quality video, HEVC H.265 video can reduce file size of 52% for 480p video, 56% for 720p video, 56% for 720p video, 62% for 1080p video and 64% for 4K UHD video compared h.265 to H.264/MPEG-4 AVC. On the downside, though, compared to H.264, HEVC H.265 is quite new, which means far less compatibility. Plus, 4K HEVC H.265 has higher demand on the CPU vs H.264. The CPU usage is sure to affect the battery performance. That's to say, even when you can play 4K HEVC on iPhone iPad, your device will sooner run out of battery and more likely to get hot. Anyway, you will need a H.265 converter to convert HEVC H.265 to H.264. This guide will show you how to convert 4K HEVC H.265 to H.264 with Handbrake. Try MacX Video Converter Pro - A fast 4K HEVC h265 encoder/decoder, which convert 4K H.265 to 4K H.264, HD h265 to 4K h264 MP4, MOV, MKV, AVI, etc with No.1 fast speed. 5X faster than Handbrake. Step 1: Launch Handbrake. Open source H.265 (MKV) file into HandBrake by clicking "Open Source" -> "File". You can click the "Add to Queue" button to convert HEVC to H.264 Handbrake in batches. Step 2: In the Destination field, specify the file name and folder to save the 4K HEVC h.265 to h.264 converted video. Step 3: To free convert H.265 to H.264 in Handbrake, choose MP4 container in the Output Setting. 1. You can select a device preset from the list on the right, and most of them are in MP4. 2. You can also select free convert HEVC MKV to H.264 in 1080P, 720P, 480P etc. 3. You need to check if the video codec for the MP4 is H.264 by clicking Video. Step 4: Press "Start Encode" icon on the top bar to begin the HEVC H.265 to MP4 (H.264) transcoding in Handbrake at once. 1. HandBrake 1.0.0/1 supports Quick Sync encoder to speed up H.264 encoding. To speed up the H.265 to H.264 conversion in Handbrake by QSV tech, go to Preferences and click Video to enable the Intel QuickSync encoder. 2. You can also set available HandBrake Quick Sync options to adjust parameters of the videos (frames, bitrate etc.) by inputting string (option1=value1:option2=value2) into Extra Options box in the Video section. 3. When the input 4K MKV H.265 video is too large in size (larger than 4GB), don't forget to check the Large File Size box. 1. You cannot convert 4K H.265 to 4K H.264 in Handbrake. When you choose H.264 MP4 as an output format, you're able to convert 4K HEVC H.265 (3846x2160) to H.264 in 1920x1080 or lower only. If you don't want any resolution downscale, the output 4K needs to be in H.265 MKV. 2. The output HD h.264 files will be large in size. As H.265 has better compression ratio than H.264, the original 4K H.265 will have a relatively smaller size than H.264. But when you convert 4K h.265 to H.264 in HandBrake, even in HD 1080P, the output video can be very large. And Handbrake doesn't provide many options to keep the size down. 3. You cannot free convert H.265 to H.264 using Handbrake into other formats. Though H.264 Mp4 is very widely used, you may sometimes want H.264 to be stored in MOV, AVI, MTS, etc for specific purpose. But with Handbrake h265 solution, you're missing out. ▶ The first time when I converted a MKV (hevc h.265) video, 04:29, 3846x2160 to MP4 (h.264) 1080p, the computer operation got stuck as soon as I click the Start Encode. ▶ The second time, Handbrake quickly finished the job, but converted the first 7 seconds only. ▶ The third time, I tried the fixes in "why Handbrake won't convert the whole movie", and it finally started to convert the whole 4K video. The whole 4K H.265 to h.264 conversion process took 18 minutes, longer than I wanted. If you encounter the same trouble when you convert HEVC H.265 to H.264 in Handbrake, there are faster and more reliable alternatives to the free h.265 to h.264 converter, just like MacX Video Converter Pro. 1. Freely convert HEVC H.265, MKV to H.264, MP4, MOV, AVI, FLV, WMV, 3GP and 370+ digital formats. 2. Freely convert HD 1080P/720P, 8K, 4K H.265 to H.264 4K/8K, HD/SD with untouched quality. 3. Intel's QSV, multi-core tech ensures No.1 fast speed, 5X faster than Handbrake to convert H.265 to H.264. And the Auto Copy has 10x faster speed. 4. Even when the input HEVC H.265 is in 1080P, 720p or SD, it will convert 1080P H.265 to H.264 4K resolution. 5. Freely download online HEVC H.265 videos and convert to H.264 from YouTube, Vimeo, FaceBook, and 300 more sites. 6. Advanced editing features, parameter adjustments will compress 4K UHD videos in 40% to 70% smaller size with no quality loss. 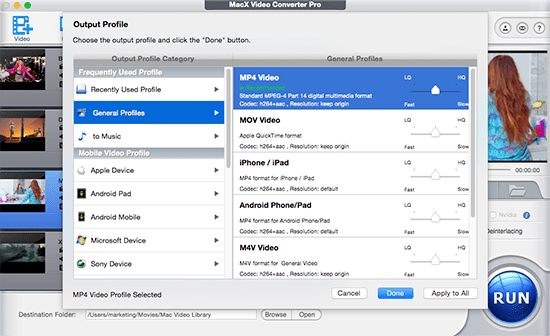 MacX Video Converter Pro can easily convert X265 to X264 video and vice versa at a speed higher than Handbrake. It also supports up to 370 audio/video codecs, including HEVC H.265, H.264, VP9, AVI, QuickTime MOV, FLV, MP4, MKV, DivX, etc. and makes them playable on iPhone, iPad, iTunes, Android devices, 4K UHD TVs, 4K video player, computer smoothly.